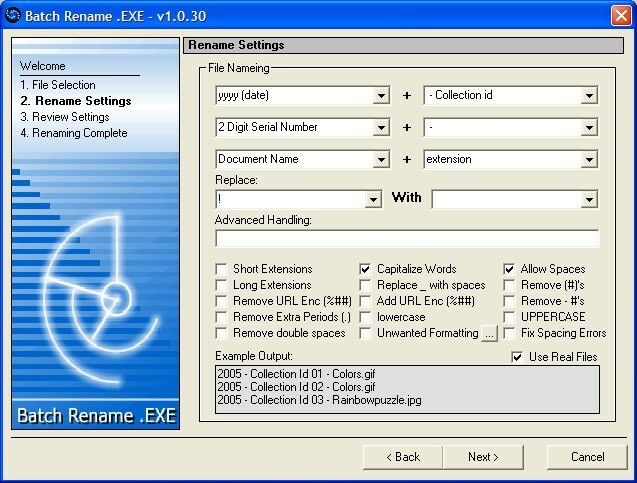 Batch Rename .EXE 1.0.51 is other software developed by SoftTech InterCorp. Run dynamic lists of files through an extensive array of filename filters to ensure that your files are labeled and organized exactly how you want them. Use filters to add information, remove spaces, change capitalization and more. 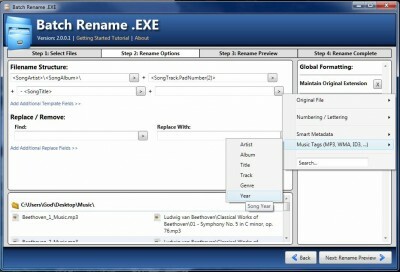 Batch Rename .EXE provides you with comprehensive labeling solution in just three simple steps. This other program is freeware, so you can download and use it absolutely free. Batch Rename .EXE 1.0.51 supports different languages (including English). It works with Windows 98/XP/Vista. Latest Batch Rename .EXE 1.0.51 does not contain any spyware and/or advertise modules, allowing installing it with no worries concerning valuable information loss. We has completely tested other software Batch Rename .EXE 1.0.51 many times, written and published the interesting article and uploaded installation file (977K) to our fast server. Downloading Batch Rename .EXE 1.0.51 will take several seconds if you use fast ADSL connection.